One, the portion of the script that adds shadows to the diffuse color was removed. This has the same effect as setting incandescence to 1.0 on a Lambert in the Hypershade. A color was added and the Kd value was ramped up to 1.7 to create the overexposed effect. 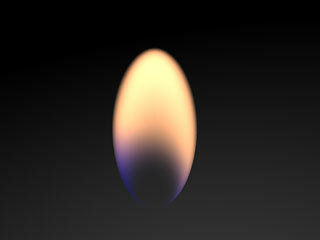 Two, rimwidth and rimheight variables were added to create the translucent hollow in the center of the flame. When multiplied by t, they make a rim whose width changes based on how far up the flame it is. Three, a second smoothstep was added to the calculation of Oi (again, based on t) to create the soft edge near the top of the flame.